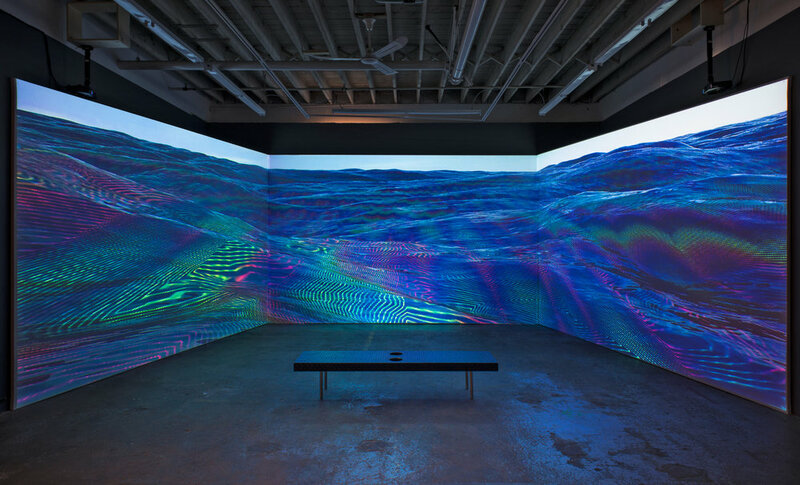 SIGNALS is a collaborative project by artists Nicolas Sassoon (Vancouver, BC) and Rick Silva (Eugene, OR) that focuses on immersive audio-visual renderings of altered seascapes. Sassoon and Silva share an ongoing theme in their individual practices; the depiction of wilderness and natural forms through computer imaging. Created by merging their respective fields of visual research, SIGNALS features oceanic panoramas inhabited by unnatural substances and enigmatic structures. The project draws from sources such as oceanographic surveys, climate studies and science-fiction to create 3D generated video works and installations that reflect on contamination, mutation and future ecologies. Nicolas Sassoon is an artist based in Vancouver BC Canada. Sassoon makes use of early computer imaging techniques to render visions of architectures, landscapes and natural forces. His practice translates ideas of materiality and immateriality into digital animations, installations, prints, and sculptures. Sassoon’s work explores the contemplative and projective dimensions of screen-based space, and how the digital image can express dimensions of the physical realm. While most of his output is published online, Sassoon also materializes his web-based practice into a wide range of Medias. His visual research often leads him to engage in cross-disciplinary projects in the fields of architecture, electronic music, textiles, and art. Sassoon is a founder of the collective W-A-L-L-P-A-P-E-R-S. His work has been exhibited at The Whitney Museum of American Art (US), Eyebeam (US), 319 Scholes (US), Vancouver Art Gallery (CA), Plugin ICA (CA), Contemporary Art Gallery (CA), Charles H.Scott Gallery (CA), Western Front (CA), PRETEEN Gallery (MX), Victoria & Albert Museum (UK), the Centre d’Art Bastille (FR), HeK Basel (SW), MU Eindhoven (NL) , Today Art Museum (CN), the Berlin Fashion Week (DE)) and the New-York Fashion Week (US). Rick Silva was born in 1977 in Brazil and lives in Eugene, Oregon, where he is an Associate Professor of Art & Technology at the University of Oregon. He received an MFA from The University of Colorado in 2007, and has since shown extensively nationally and internationally, with solo exhibitions at Transfer Gallery in New York, Wil Aballe Art Projects in Vancouver, New Shelter Plan in Copenhagen, and Interstitial Gallery in Seattle. Silva’s projects and collaborations have been featured in festivals such as Sonar in Barcelona, Transmediale in Berlin, and Resonate in Belgrade. His works and installations have been acquired by multiple permanent collections including the Whitney Museum of American Art, the Borusan Contemporary Collection, and the Jule Collins Smith Museum of Fine art at Auburn University. WIRED magazine called Silva’s videos "glitchy, curious things; some mesmerizing, some arresting."